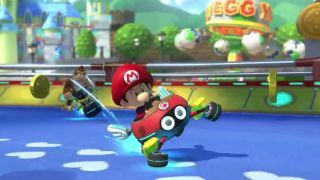 Forget everything else that's happening in the world of tech and gaming, cancel all your future plans, and focus on the only thing that matters right now: Baby Park is coming to Mario Kart 8. The simple oval quickly became a fan favourite back in the Double Dash days, and will now come part of a new DLC pack on April 23. Just imagine how much better it's going to be in 200cc. Other new tracks include Animal Crossing, Wild Woods, Super Bell Subway and Big Blue, as well as the vintage Koopa City (3DS), Ribbon Road (GBA) and Cheese Land (GBA).